Perfect for healthy fall recipes, butternut squash can be included in a variety of menus. It's nutritious (maybe more so than you think) and adding it to meal plans will help meet your body's daily nutritional needs. If you're looking for a healthy starchy veggie that isn't high in calories, butternut squash may be just what you've been searching for. It provides just 82 calories per 1-cup cooked portion. And because it's rich in carbs and fiber, it'll help fill you up without the extra calories many other starchy foods provide. Squash is rich in carbs, which is one reason it helps boost your energy levels. One cup of cooked butternut squash contains just over 21 grams of carbohydrates, including 7 grams of dietary fiber, meaning this starchy veggie is a high-fiber food. A 1-cup portion of butternut squash also provides about 2 grams of protein and almost no dietary fat (about 0.2 grams). 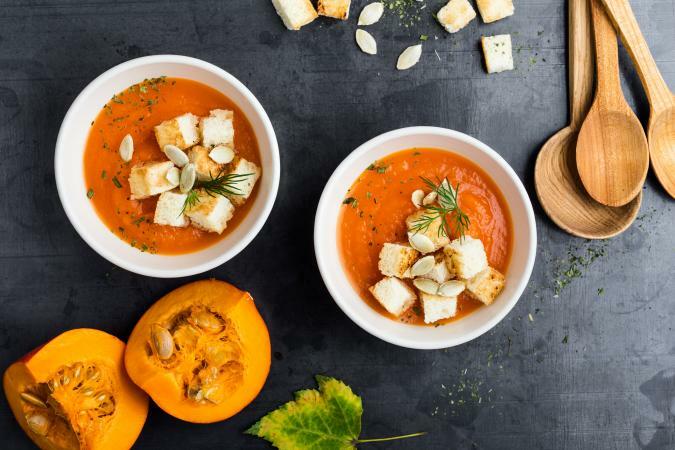 When you choose butternut squash, you'll be getting a good source of vitamin C, vitamin A, niacin, folate and vitamin E. Squash is extremely high in vitamin A, providing almost 23,000 international units (IUs) in each 1-cup cooked portion. That's over 400 percent of an adult's recommended daily value! Vitamin A aids in good vision, reproduction and immune function and enhances organ function. Adding squash to menus is a perfect way to get in your daily dose of vitamin A and fiber. Put squash in casseroles, soups, stews, chilis, banana breads, pancakes, lasagna or other pasta dishes, cold salads, omelets, rice dishes, quesadillas, burritos, fajitas or breakfast smoothies. Or, bake squash as a side dish and top it with butter plus your favorite seasonings.